Last week, we published our AMD 2nd Gen Ryzen Deep Dive, covering our testing and analysis of the latest generation of processors to come out from AMD. Highlights of the new products included better cache latencies, faster memory support, an increase in IPC, an overall performance gain over the first generation products, new power management methods for turbo frequencies, and very competitive pricing. In our review, we had a change in some of the testing. The big differences in our testing for this review was two-fold: the jump from Windows 10 Pro RS2 to Windows 10 Pro RS3, and the inclusion of the Spectre and Meltdown patches to mitigate the potential security issues. These patches are still being rolled out by motherboard manufacturers, with the latest platforms being first in that queue. For our review, we tested the new processors with the latest OS updates and microcode updates, as well as re-testing the Intel Coffee Lake processors as well. Due to time restrictions, the older Ryzen 1000-series results were used. Due to the tight deadline of our testing and results, we pushed both our CPU and gaming tests live without as much formal analysis as we typically like to do. All the parts were competitive, however it quickly became clear that some of our results were not aligned with those from other media. Initially we were under the impression that this was as a result of the Spectre and Meltdown (or Smeltdown) updates, as we were one of the few media outlets to go back and perform retesting under the new standard. Nonetheless, we decided to take an extensive internal audit of our testing to ensure that our results were accurate and completely reproducible. Or, failing that, understanding why our results differed. No stone was left un-turned: hardware, software, firmware, tweaks, and code. As a result of that process we believe we have found the reason for our testing being so different from the results of others, and interestingly it opened a sizable can of worms we were not expecting. What our testing identified is that the source of the issue is actually down to timers. Windows uses timers for many things, such as synchronization or ensuring linearity, and there are sets of software relating to monitoring and overclocking that require the timer with the most granularity - specifically they often require the High Precision Event Timer (HPET). 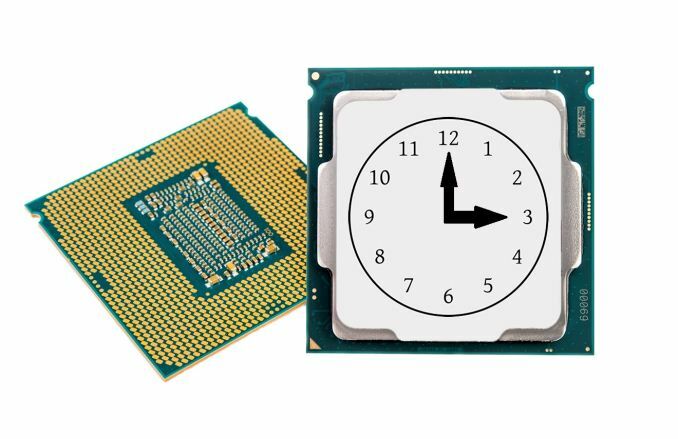 HPET is very important, especially when it comes to determining if 'one second' of PC time is the equivalent to 'one second' of real-world time - the way that Windows 8 and Windows 10 implements their timing strategy, compared to Windows 7, means that in rare circumstances the system time can be liable to clock shift over time. This is often highly dependent on how the motherboard manufacturer implements certain settings. HPET is a motherboard-level timer that, as the name implies, offers a very high level of timer precision beyond what other PC timers can provide, and can mitigate this issue. This timer has been shipping in PCs for over a decade, and under normal circumstances it should not be anything but a boon to Windows. However, it sadly appears that reality diverges from theory – sometimes extensively so – and that our CPU benchmarks for the Ryzen 2000-series review were caught in the middle. Instead of being a benefit to testing, what our investigation found is that when HPET is forced as the sole system timer, it can sometimes a hindrance to system performance, particularly gaming performance. Worse, because HPET is implemented differently on different platforms, the actual impact of enabling it isn't even consistent across vendors. Meaning that the effects of using HPET can vary from system to system, as well as the implementation. And that brings us to the state HPET, our Ryzen 2000-series review, and CPU benchmarking in general. As we'll cover in the next few pages, HPET plays a very necessary and often very beneficial role in system timer accuracy; a role important enough that it's not desirable to completely disable HPET – and indeed in many systems this isn't even possible – all the while certain classes of software such as overclocking & monitoring software may even require it. However for a few different reasons it can also be a drain on system performance, and as a result HPET shouldn't always be used. So let's dive into the subject of hardware timers, precision, Smeltdown, and how it all came together to make a perfect storm of volatility for our Ryzen 2000-series review. It suggests that their implementation could probably be made less impactful than it currently is; but that high precision timers have had a performance impact has been known for a long time. In its guise as the multi-media timer in Windows over a decade ago the official MS docs recommended using lesser timing sources in lieu of it whenever possible because it would affect your system. I'd be more concerned that Intel has found a way to make the timer report false benchmarks that are higher than they actually are. I'd also be curious if the graphics card/cpu combination is potentially at fault. I came across a similar issue on VMware, where a virtual machine's clock would drift out of time synchronisation. The cause of this was that VMWare uses a software based clock and when a host was under heavy CPU load the VM's clock wouldn't get enough CPU resource to keep it updated accurately. This resulted in time running 'slowly' on the virtual machine. Under normal circumstances this kind of time driftissue would be handled by the Network Time Protocol daemon slewing the time back to accuracy; the problem is the maximum slew rate possible is limited to 500 parts-per-million (PPM). Under peak loads we were observing the VM's clock running slow by anywhere up to a third. This far outweighed the ability of the NTP slew mechanism to bring the time back to accuracy.